The chicken strains to be tested by African Chicken Genetic Gains in Ethiopia (image credit: EIAR/S. Abegaz). The African Chicken Genetic Gains (ACGG) is an International Livestock Research Institute (ILRI)-led and Bill & Melinda Gates Foundation (BMGF)-funded five-year (2015–2019) project that seeks to increase access of poor smallholder farmers in Ethiopia, Nigeria and Tanzania to more productive and agro-ecologically adaptable chicken strains. ACGG Ethiopia will test five introduced (Koekoek, Fayoumi, Sasso, Kuroiler, Embrapa 051) and at least two local chicken strains (the improved Horro and a few others) for 18 months under semi-scavenging and on-station management conditions for egg and meat productivity, adaptation, and preference by farmers and actors in the poultry value chain. 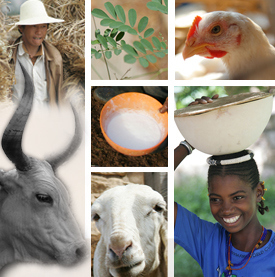 The Ethiopian Institute of Agricultural Research (EIAR) is a principal national partner in the project and all activities of the project are overseen by the Ethiopia Ministry of Livestock Development and Fisheries. A total of 2500 smallholder chicken-keeping households from the Oromia, Amhara, Tigray, Southern Nations, Nationalities, and Peoples’ (SNNP), and the Addis Ababa regions, residing in 21 districts and 63 kebeles (villages) will take part in the on-farm chicken performance test. 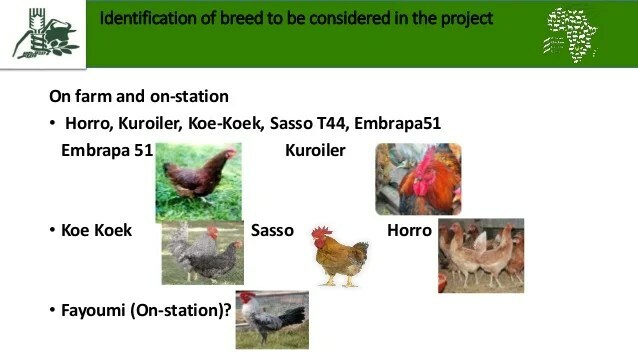 The breeds that will be tested are introduced in this new Preliminary information on chicken strains to be tested in Ethiopia fact sheet. More information is also available on specific strains below. Tags: briefs, chicken strains, Embrapa051, Fayoumi, Horro, Kuroiler, Potchefstroom Koekoek. Bookmark the permalink.